We've had a great summer with our art workshops here at PONSHOP. This summer alone, we've had over sixty students in our studio doing a variety of activities. Thanks to all of our students and parents for making the past three months so memorable. Intro to Street Art, Skate to Create, Kids' Drawing, Adult Mixed Media, Adult Clay, Ice Resin Bracelet, Altered Spoon Ornaments, Intro to Plush Making, Intro to Sewing, and PONSHOP Academy - a special six week workshop for children who are serious about exploring a variety of media, from sculpture and clay to painting and mixed media. Registration is Now Open! Simply call us at the shop (540) 656-2215 to register today. February 2012 kicked off another fun session of Mixing the Media. 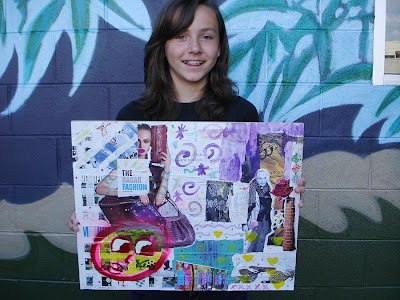 In three 1.5 hour sessions students explored collage and acrylic painting to create their own mixed media scenes on canvas. Below are some pics of the student work. Congrats guys! For more information about PONSHOP classes click here. This was one of the first adult mixed media classes held at the new PONSHOP location and I was really happy to work with such motivated and enthusiastic students. 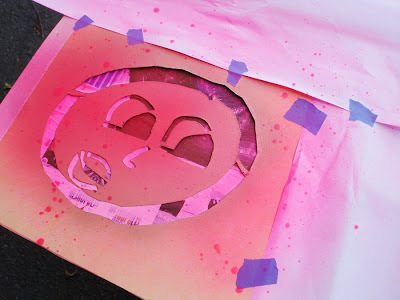 Using a variety of media including acrylic, paper collage, and stencils, they took on their own projects in a studio environment. Shellie translated a graphite sketch of a cityscape into a mixed media collage. Donna was interested in layering paper collage as a background and then drawing and cutting her own stencil form. 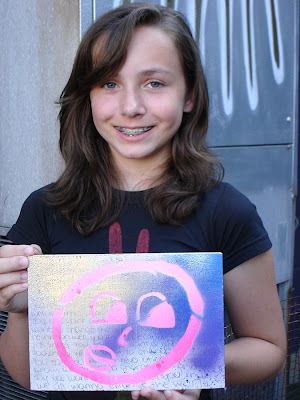 Donna used two layers of stencils as well as acrylic paint to complete her piece. PONSHOP offers classes in Ceramics, Mixed Media, Street Art, Architecture, and Skateboard Design for children as well as Ceramics and Drawing for adults. Our classes run throughout the summer and through the fall. For a current class schedule, Click Here. 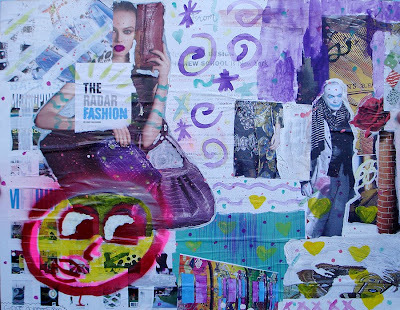 The "Mixing the Media" workshop combined several different methods to create a work of art. Students practiced graphite drawing, acrylic painting and some spray paint methods to achieve their desired images. 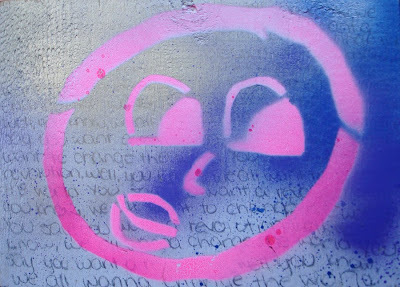 Ty created a background using spray paint and then applied his illustration using glue and wheat paste. Avianna painted her farm scene using acrylic paints and later placed her cow figure in the scene. Congrats to the students for a job well done! Avianna did a "Mixing the Media Workshop" with me back in June. She is into dragons so I helped her make a stencil of her favorite dragon design. Her last day was spraying the dragon stencil on her board, but she also an opportunity to explore spray paint on her collage background. In the "Mixing The Media" workshop, students combined scraps of paper, acrylic paint, spray paint and stencils to create their compositions. Grace and Jeff were excellent students and methodically layered their boards with images,color, and form until complete. Grace used xerox copies of earlier sketches as well as magazine clippings and some stock stencils in her collage. Jeff brought his own artillery of stencils to the class and used them to adorn the perimeter of his collage. We concentrated on creating a "space" for the figures in the foreground, using layers of gesso and spraypaint over the newsprint text. As a quick painting exercise, Grace painted a 6"x6" wood block portrait of her dog Farrah. Thanks to all students that participated in this summer's workshops.